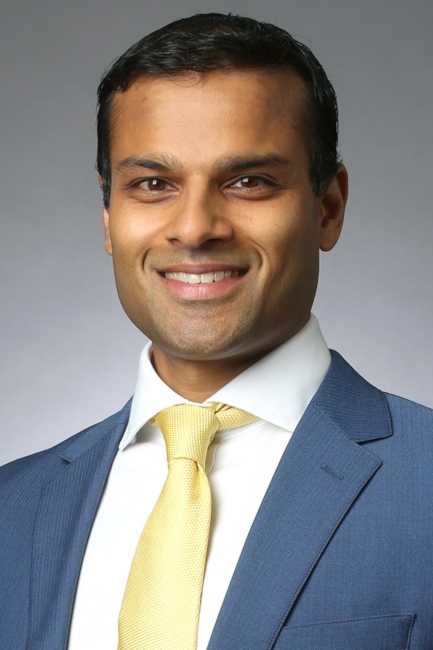 Roshan P. Shah, MD, JD, specializes in hip and knee reconstruction ausing minimally invasive techniques for less pain and faster recovery times. He believes there are many valuable pain-relieving treatments that do not involve surgery. When an operation is needed, he embraces careful surgical techniques with attention to the biological, anatomical, and mechanical restoration that is critical for a pain-free return of function. Dr. Shah has a particular interest in complex primary and revision hip and knee replacements, as well as associated fractures and infections. As Director of Complex Adult Hip and Knee Reconstruction at Columbia University, he has reconstructed failed total hips and knees using sophisticated techniques and technologies. He has successfully treated patients from across the United States and neighboring countries, finding solutions to problems that stump others. Dr. Shah has made several contributions to research, having published 40 peer-reviewed articles, textbook chapters, and editorials, in addition to giving more than 30 scientific presentations. He served as editor of the University of Pennsylvania Orthopaedic Journal and the Yale Journal of Health Law, Policy, and Ethics. He was also an associate editor for the Stanford Law and Policy Review. Dr. Shah has been honored with multiple research awards, including 1st place at the Orthopaedic Research and Education Fund/Orthopaedic Research Society symposium, 2nd place at the Philadelphia Orthopaedic Society for Sports Medicine Research Symposium, the AO Kathryn Cramer Award, and the University of Pennsylvania Orthopaedic Journal Resident Recognition Award. He holds one provisional patent application for a patient safety device innovation. As a former Washington health policy fellow for both the American Academy of Orthopaedic Surgeons, and the American Association of Hip and Knee Surgeons, Dr. Shah continues to advocate for policies that serve patients, improve access to care, and support research and innovation. He was invited to speak on FDA regulatory issues and innovation within the field of orthopedic surgery at a meeting in Washington, D.C.
A native of Camden, New York, he earned his B.A. in Chemistry from Dartmouth College, with additional concentrations in philosophy and public policy. He received his doctor of medicine degree from Yale University and his juris doctor degree from Stanford University. He was a resident in orthopedic surgery at the University of Pennsylvania, where he received the DeForest Willard Award for outstanding performance as an orthopedic senior resident and the Marvin E. Steinberg, MD Award in Adult Reconstruction for outstanding work in the field of adult reconstruction surgery. He also completed a post-doctoral research fellowship (in the field of tissue engineering for orthopaedic surgery applications) at the McKay Orthopaedic Research Laboratory. Before joining ColumbiaDoctors, he completed a fellowship in Adult Hip and Knee Reconstruction at Rush University. Additionally, he has travelled to Wrightington, England to study advanced principles of the hip at the Charnley Centre for Hip Surgery.